Australian off-roaders are an incorrigible sort. No boat? We’ll just take the Land Cruiser, no worries. 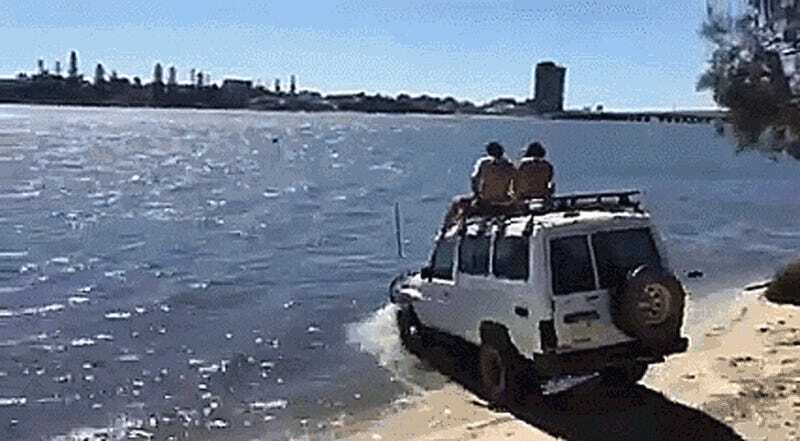 This video as posted on Facebook shows a couple dudes sitting on the roof of a Toyota Land Cruiser Troop Carrier (colloquially known as a “troopy” Down Under) as the truck rolls into the Swan River and the guys on top toss out some crab nets. Passengers throw out a couple nets and the truck returns to dry land without incident. See, those snorkels really do work! This Toyota is almost certainly a diesel, which generally offer better survivability when submerged. A diesel engine usually only needs one main intake above the waterline to keep running, while many gasoline engines have too many little breathers to pull something like this off successfully. The truck muscles through that current pretty well, too! Sure wish we could buy these in the United States. Come to think of it, the oldest ones should be ripe for the 25-year import exemption by now. What are you waiting for?